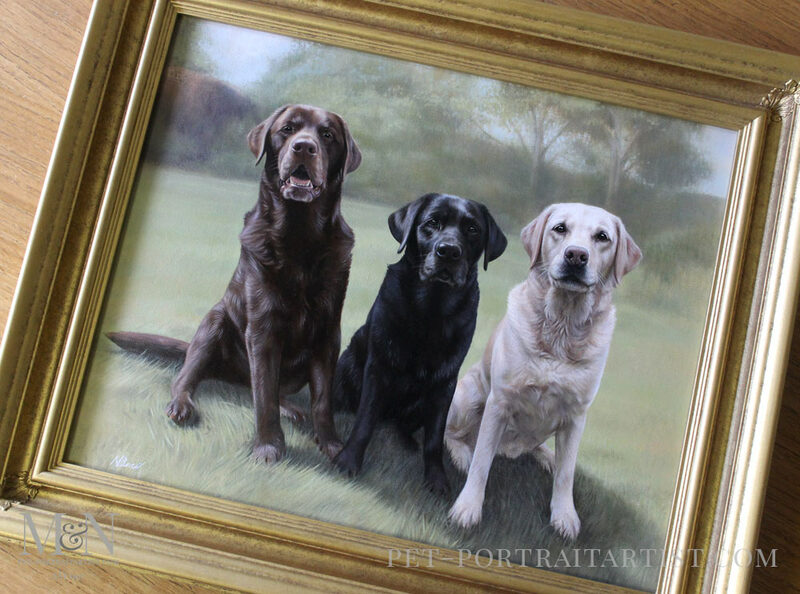 Welcome to the Oil Portrait of Maco, Rex & Rosie. 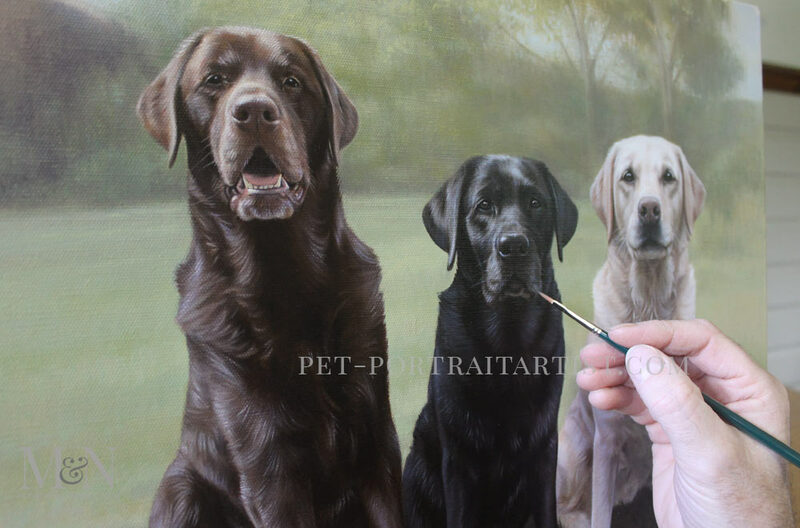 Our client Katie contacted us asking if Nicholas could paint their dogs for birthday surprise. Katie inlisted her daughters helping in taking photos. She took a number of fantastic photos of the dogs in their garden on a sunny day. Taking a variety of photos of the dogs all together they too took some individual photos of each dog too. This was fabulous as we could see them in more detail. They also wanted their garden as background for the portrait. They took a few further photos of their garden from varying angles for us to use. Using a familiar background for the portrait really helps to make the painting feel personal. Taking good quality photos makes a huge difference to us as artists. To be able to paint the animals in detail, especially to get the lighting correct is essential. We are truly grateful as to how patient our clients are when taking photos. Our photography tips webpage is very helpful for clients. Katie sent this wonderful testimonial after presenting the painting to her husband who was thrilled. Andrzej my husband is absolutely thrilled with the picture and he is a hard task master when it come’s to these things. His face when he opened it was sheer joy and he is really appreciative of the skill and expertise that has gone into it. You have captured each dog perfectly. I will send you a picture in due course. I have added a photo that shows the painting close up with Nicholas’ hand in the frame so you can see the scale of the painting. 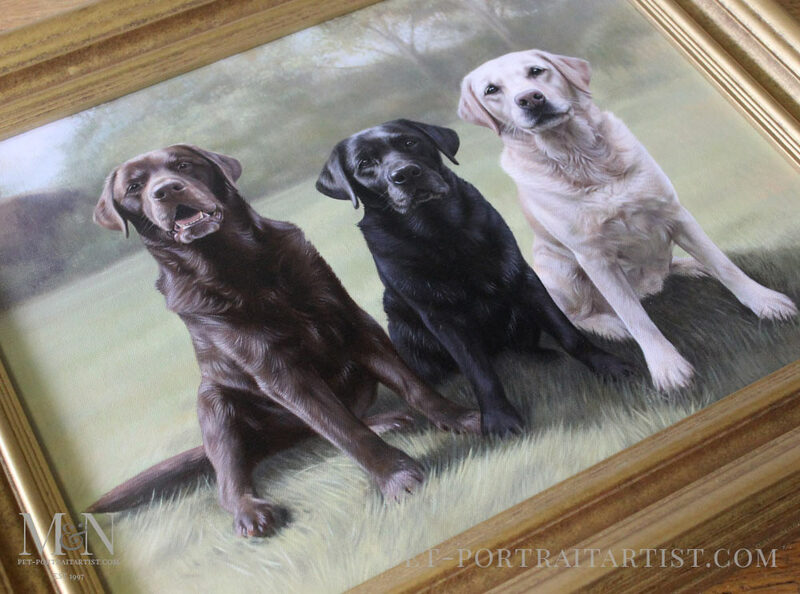 Here are the photos of Macko, Rex and Rosie’s pet portrait framed. The frame is our beautiful Chelsea frame and it works absolutely stunningly with this painting. 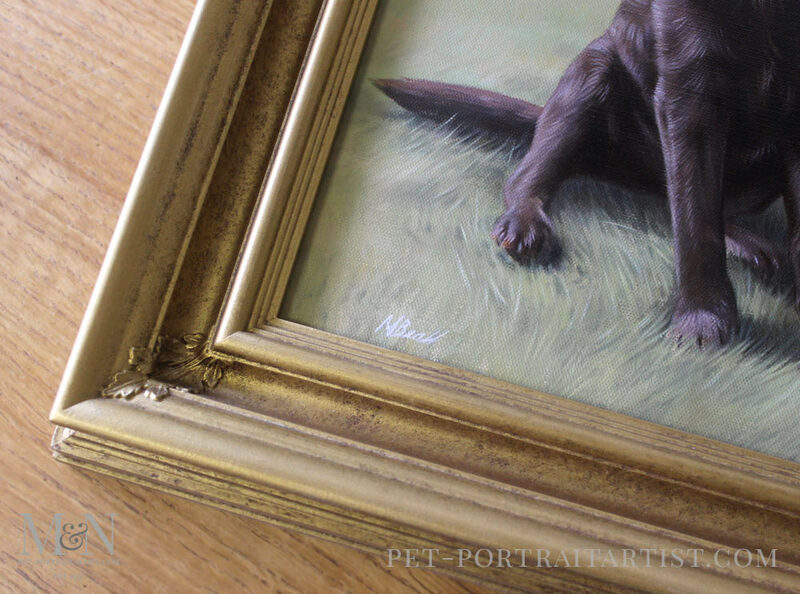 The colour of the gold is very natural and is slightly aged in the framers painting process and so there is a lot of interest in the frame itself. Each frame is handcrafted and so no two frames are ever identical. The colours and tones work really well with natural greens, particularly the garden / landscape scenes which Nicholas paints. His colour pallet is very natural and organic and so the overall feel to his paintings are very calming. The other great thing about our framers is that as each frame is made bespoke, the depth of the frame is built to cover the depth of our particular canvases. Our canvases are made by Harris Moore in the UK and they are usually around 21mm deep. 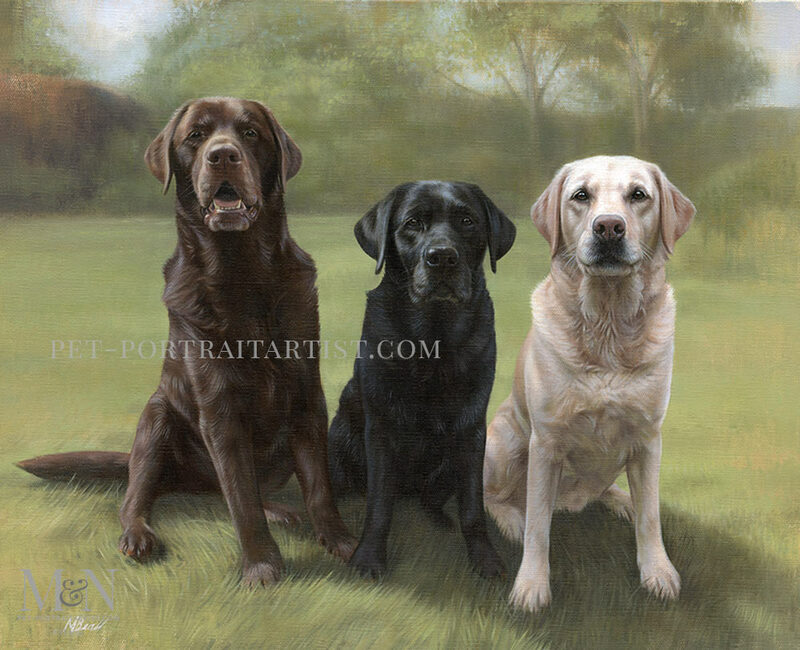 They are stretched on hardwood (Tulipwood) and so can either be displayed on the wall, with painted edges, or framed like the painting of Macko, Rex and Rosie below. So if clients are thinking about framing their own paintings, the depth is definitely something to keep in mind. When our paintings are framed we need to protect them as best we can as they are sent to our clients via courier. They travel far and wide and sometimes have quite long journeys, to America and Australia for instance. We always make sure each pet portrait parcel is packed safely and securely. 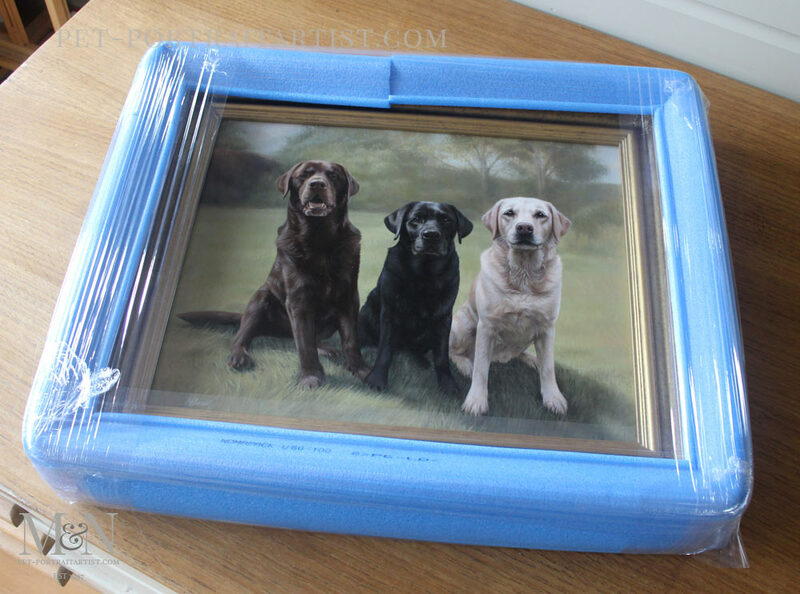 For all framed paintings we use a really sturdy foam edging which protects the frame beautifully. 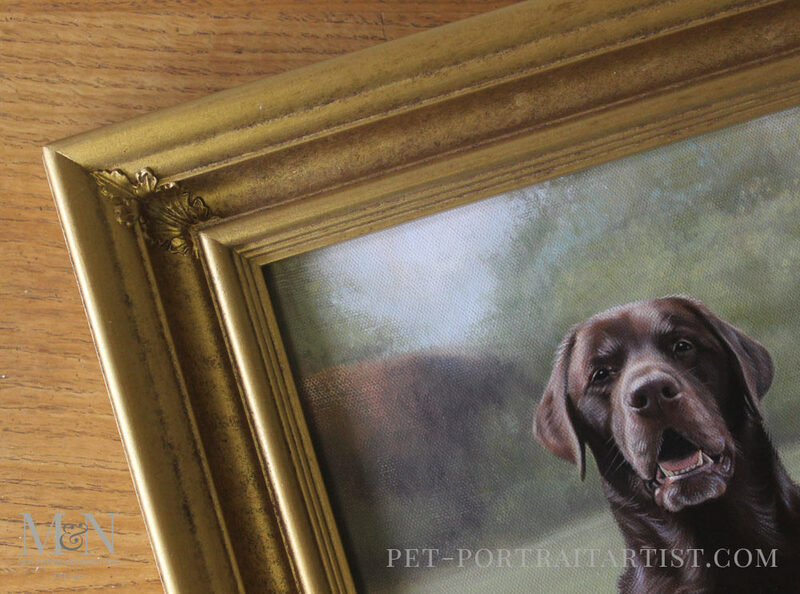 The photo below is the most recent pet portrait to be packed and if you head over to our ‘pet portraits commissioning process‘ page you can see why it takes me a few hours to pack each one. The photo shows the portrait with the foam edging all being held in place by ‘happy wrap’. I am never too sure what the ‘happy wrap’ is officially called. It’s just my term for it as I find it so fun to use.. it really makes me happy! It comes on a roll with a plastic handle. You wrap it around the edges of the frame and it sticks to itself. Its absolutely brilliant, far better than parcel tape. Once the portrait is at this stage, I then wrap it in foam wrap, cut two sheets of hardboard and then wrap it in more foam wrap.